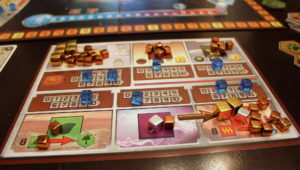 Concepts: In ‘Terraforming Mars’, each player takes the role of a large corporation. You work together to change the atmosphere of the planet Mars, shifting the temperature and oxygen in order to make it suitable to sustain human life. This is a vast project, taking several hours for the players and multiple generations in-game – but if you succeed, humanity’s future is assured! Use your wealth and energy to allow your corporation to maximize your scientific output, nourishing bountiful oceans and forests on the red planet, digging mines and orchestrating geosynchronous projects. Each of those earns you points, and the player with the most points at the end of the game is the winner! Writing: Once again, we look at the clarity of the rules as presented in the game’s rulebook and cards in this review. Each is clear and direct, with very little in the way of confusion. Make no mistake, this is a hefty game. 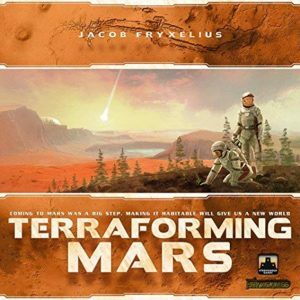 Each game of Terraforming Mars that you play will take upwards of three hours. However, the rules are laid out in an easily accessible and readily understandable manner. Although much of it may be dry for younger players, players (especially those who have an understanding of scientific theories) will find cards that are packed with witty in-jokes and amusing asides. The rulebook is laid out in a manner that is easy for quick reference, which makes this a game that you can pick up without worry as to understanding it. Mechanics: Gameplay is divided into turns, called ‘generations’, which establishes just how long a project such as terraforming a planet would take! In our game, we completed the task in ten generations. At the start of each turn, players have an option to buy up to four cards from the game’s considerable draw pile. These cards include anything from constructing mines on the planet, establishing strains of lifeforms, transporting supplies from Earth and so on – anything that will aid you during your action phase. The action phase dominates most of the game. Players can take two actions, the two most common being playing a card from their hand or buying a tile that they can place on the map. Both need to be paid for by the player from their resources in order to be played, but they can impact on the game in various ways – placing a forest tile on Mars allows the oxygen level on the planet to increase. Each player can take up to two actions before play passes to the next player – play then continues around the table until each player passes their turn (typically because they have no more money or available actions left to take). Each player has six resources – money, steel, titanium, forests, power and heat – and they refresh at the end of the action phase. Certain cards can raise how much each resource refreshes by, such as allowing the player to gain more money or power, and at the end of each turn any unused power is converted into heat. Players can, as an action, use heat to raise the temperature on the planet, and use forests to place a forest tile, so resource managing becomes very important as gameplay progresses. Once the heat and oxygen is at an optimal amount and all ocean tiles have been placed, the game ends. There are several other mechanics that are involved, but this covers the core concepts. Design: I found myself genuinely enjoying Terraforming Mars. The tokens feel nice and sturdy, and placing those little hexagons onto the red planet on the board feels suitably rewarding. Before long you are able to see a vibrant green and blue pattern shape its way across the once barren, lifeless planet. In addition, the game’s cards are colour coded for ease of reference – blue cards remain active and should be placed face up in front of you as they provide benefits every turn, whilst others may provide only a one-off benefit and can be safely filed away upon completion in your own personal discard pile (which I placed under my corporation card). At first glance, the game board looks intimidating with its large number of tracks and lists, but it soon becomes clear as to what each one means and the functions that they serve. Lastly, the resources are measured by cubes – bronze equals one unit, silver is a five and tens are a very nice gold. Each cube just looks pretty and feels good to play with! 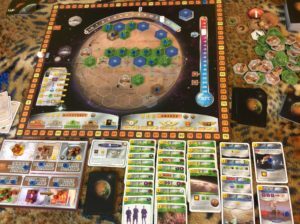 Playability: Although Terraforming Mars is technically a cooperative game because all players are working toward the same goal of creating a habitable biosphere on Mars, it is actually quite competitive. 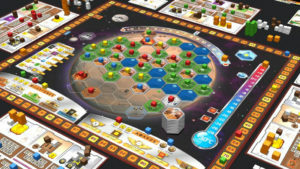 The victor is the one who scores not only the most terraforming points (accomplished by placing the right tiles and nearing the overall goal) but the most victory points. Generally, victory points are awarded by cards, and these are where the game can genuinely get quite bloodthirsty. In our game, one player was able to amass a considerable amount of victory points by building a large number of domed colony cities on the planet, with each one allowing the colonists to own pets. Each city gave that player extra victory points for each pet that was contained in the city. Another player was able to establish an armed security force – each turn they funnelled their titanium resource into building a private security militia, and at the end of the game that granted a huge ten point advantage. Another player opted to go for a highly scientific and commercial route, completing projects after projects that quickly earned her additional bonuses. 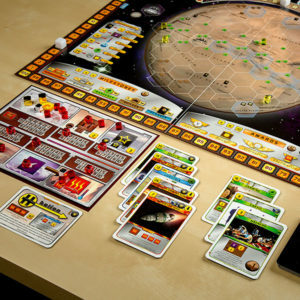 All in all, Terraforming Mars has a vast amount of different combinations and strategies available to the players, and that provides a huge amount of replay value. Conclusion: I was hesitant going in to playing Terraforming Mars. I’m not the most scientific of people, and as I’ve mentioned before on my reviews I tend to lean towards smaller, tighter games. Yet I found the scale of the game to be genuinely rewarding. It feels often like a more refined and less militaristic Twilight Imperium, one that strongly pushes the player into planning strategies and consider the long game. That makes perfect sense, because the in-game timescale for Terraforming Mars is one that takes entire generations to play out. Yet at the end of the game, we found that we didn’t really care as much about who the winner was. The feeling that we were left with was more a sense of accomplishment – we had completed the project. The project that had taken centuries to undertake, which was founded by our ancestors and which our descendants would rely upon. We had terraformed Mars. What did you do this weekend? FINAL THOUGHTS: An excellent and expansive game that leaves you feeling satisfied while at the same time rewarding your strategic mind as you gain any advantage over your opponents, Terraforming Mars is a joy to play.